Home » How New Federal Rules Will Affect Financed Closings After August 1? A few weeks ago we wrote about 8 things buyers and sellers need to know before August 1. Since then we attended a TRID (TILA-RESPA Integrated Disclosures) class taught by Westcor Land Title Company and we thought we’d bring you new information as it will affect closings this Fall. The Good Faith Estimate and initial disclosure are being replaced by a Combined Loan Estimate. This disclosure is done upfront. At the end of the loan process there are sweeping changes as well. There will no longer be a HUD-1 closing statement nor the Truth in Lending disclosure. Those are being replaced by a new 5 page single Closing Disclosure form. Ironically, this form will not suffice as a closing statement. Title companies will still need to prepare a 2 page closing statement and there is no set regulation on that. Let’s get to the issues that will affect closings. There are new rules that require 3 day disclosures to the borrower. This will require the lender to gather information from the title company so they can properly disclose to the buyer. But wait, it’s more than 3 days. If you mail the documents regulations say there is a 3 day window on top of the 3 day waiting period, so we’re looking at 6 days. Lenders may try to find a way to personally deliver the documents, but that’s not always practical. Electronic delivery may become an option, but there has to be proof the borrower is actually the one that opened and reviewed the files, so it gets tricky. Fines for non-compliance are harsh, so lenders are not going to want to mess around with this. It’ll be easier for them to say sorry, closing must be delayed. HOA’s will play an important part too. The title company will need estoppel payoffs much sooner, but they’re only good for so many days. Typically these HOA management companies want to charge extra fees for updating them, so title companies wait until end, but they won’t be able to. HOA’s need to change the way they do business or we won’t be having on-time closings. If things change, it may trigger a new re-disclosure process. If it does, plan on an extra 2 weeks. Even if an HOA fee doesn’t trigger a new waiting period, the form still needs to be changed for closing. This will require banks have people on standby just to change figures like prorations and estoppel fees that don’t affect the borrower. 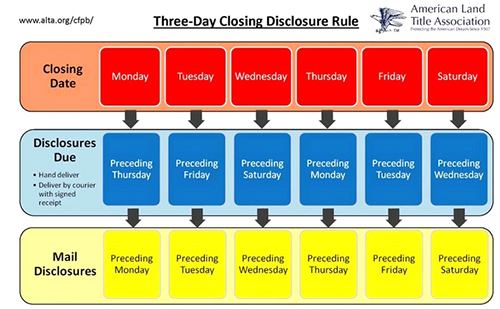 If there are walk-thru issues that affect the closing it will require the final disclosure to be redone. Who is going to do that and when? The lender will, but the lender has a hard enough time meeting today’s deadlines. Just imagine issues like this. We predict final walk thrus may be done a week or more before closing to prevent issues at closing. You can kiss the 30 day closing goodbye. It’s not going to happen. We’re probably looking at 45-60 day closings realistically. What happens when one of the agents understands the new process but the other one doesn’t? Many agents only do 1-2 transactions per year. Buyers and sellers may have to re-think who they do business with because these new rules require agents who are on top of their game, and details. The consumer will not be educated. New rules take effect, but there is no education program for consumers. They will get all their education from lenders, agents, and title companies. Let’s just hope the lenders are ready for the new forms, the new deadlines, and that the agent you’re working with is too. It will take all of us working together to pull this off. I see blood in the water. Not because it can’t work, but rather because I don’t see an entire industry all having the staffing and education necessary to pull this off at the get-go. HOA’s will need to change too. The FAR-BAR contract is being re-worked for the new rules. Most people won’t know that the new Federal rules violate state laws in 24 states, including Florida, in regards to sections C. and H in the new Closing Disclosure. So it will be interesting, and some changes will have to be made. Until then, pray that your lender and agent are prepared for August 1. If not, your closing may not take place. Search MLS listings in SW Florida the new and easy way. Posted in Southwest Florida Real Estate.Tagged New Federal Rules Will Affect Financed Closings, TRID disclosure.